King Narnode Shareen, king of the Gnomes, sent the 10th Squad to decommission the shipyard on the eastern coast of Karamja. However, the 10th Squad has not reported back, and King Narnode believes that something is amiss. Can you find out what happened to the squad? The King of the northern gnomes, Narnode Shareen, is once again in need of your help. He recently decided to send an envoy of his Royal Guard, the 10th squad, to oversee the decommissioning of the gnome-owned ship-building facilities on the eastern coast of Karamja. It has been quite some time since the 10th squad were dispatched and they have been deemed missing in action. Can you unravel the mystery behind the deception? Can you separate the truth from the lies? Can you decide for yourself what is real and what is not? Warning: This is a challenging and arduous quest. Only the most hardened of adventurers need apply. To start just speak to King Narnode Shareen who is found in the Grand Tree of the Tree Gnome Stronghold. He says that he has sent the 10th Squad to destroy Glough's shipyard in Karamja, but they haven't returned. Tell him that you'll help and he will give you a Gnome Royal Seal. Go upstairs to the top of the tree and ride the glider to Karamja with the Seal in your backpack (Gandius on the Pilot's map). With the Gnome Royal Seal in your inventory, head north of the landing spot and enter the shipyard (from the Grand Tree quest). You will need to show your Royal Seal to be able to enter. Speak to G.L.O. Caranock in his office hut, who will say that the fleet never made it there. Fly back to the Grand Tree (Ta Quir Priw on the map) and talk to the king again. Go to the first floor (second floor using the American floor numbering system) and talk to Daero at Burberry's bar. He will bring you to the hangar, and after he and Waydar speak for a bit, talk to Daero again. He says that you'll need to wait for 'reinitialization' to be completed before the gliders will fly. You will need to complete a puzzle to finish the process. Search the crates nearby for some Spare Controls, which show you what the finished puzzle should look like. 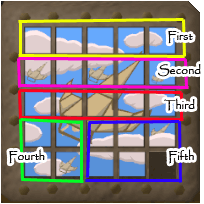 Operate the Reinitialization Panel to the south of Daero to see the puzzle, which is un-arranged. You need to slide the puzzle pieces to make the scene shown in the Spare Controls. Start from the top at the left and work your way down to the bottom row, going row per row. 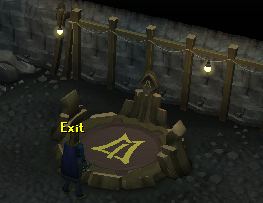 If you really can't seem to solve the puzzle, find Glough in his house to the north of the Gnome Agility Course, and pay him 200,000gp to do the puzzle for you. After that, you just need to move one piece to finish it. After completing the puzzle, the room will shake and the gliders will unfold, talk to Daero and Waydar then go gear up because here is where it starts! Note: If at any time you wish to leave the hangar, you can do so by using the Gnome Teleport Device to the south in the hangar, you will be teleported close to the gnomeball field. 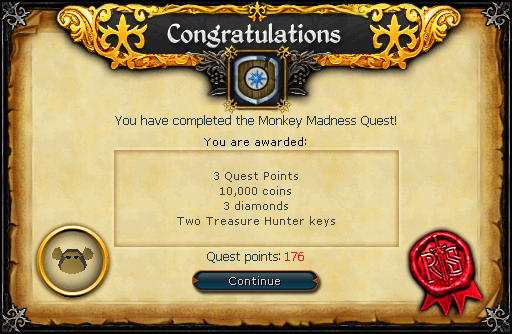 Now is the time to put on your Monkey Madness Survival gear. You will encounter many powerful monsters (mostly monkeys) that will pack a punch to low levels. These monsters will attack with either melee or range, so wear some good melee armour (or at least the best melee armour you have). Wearing either range or magic armour will mean that at one point you will have your weakness exploited, so avoid doing that if possible. A ring of life may be useful here as well in case something goes awry. Food. Take the cheapest food that heals you best. For example, if at your hitpoints monkfish and lobsters heal the same, take the lobsters over the monkfish. This will prevent you from wasting any money on food. 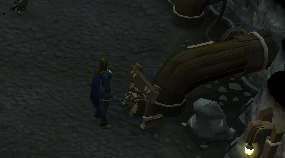 Saradomin brews can be helpful here, particularly with low lifepoint players. They heal 500 life points a dose, meaning they heal 2000 life points per inventory slot. High healing food may only heal 500-600 life points per inventory slot for those players, hence Saradomin Brews will help you much more than regular food (although, as a warning, the brews do lower your offensive stats). Optional: Energy Potions and Anti-Poison potions. Energy potions will help you as you will be running around a lot. Anti-Poison potions will help as many inhabitants of Ape Atoll are poisonous; however the posion encountered here is not hard hitting. When you have geared up talk to Daero at Blurberry's bar to go to the hangar again and talk to Waydar there. Say that you're ready to go and you'll land on Crash Island near Karamja. 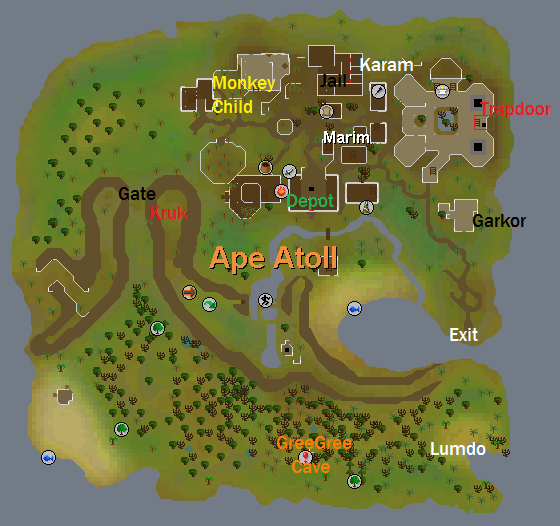 For more info about the area, check out the Ape Atoll Guide. Now talk to Lumdo there who at first refuses to help you. Talk to Waydar, and he will convince him and bring you to Ape Atoll. You'll find yourself on Ape Atoll, head northwest through the jungle and follow the cliff towards the pass. Put your Protect From Missiles Prayer on and try to get through, you'll be instantly knocked unconscious from arrows but at least you won't get any damage that way, but it won't protect you from poison. You'll wake up in jail with three members of the 10th Squad, and two Gorilla Guards. Don't approach the fence while they're near, or you'll be punched (they have a range of two squares and hit through the fences much like using a halberd). Talk to the three gnomes there to get some more information and take your time to see the guard's pattern. When both guards are at the north side of the room, pick the lock and hide to the west of the cell (do not attack the posionous spider outside the cell). When the guard is going to the other gorilla, run out the door behind him without being noticed. Once outside you head immediately to the north (right) into the tall grass and hide there. Tip: Hiding in the grass works a lot better in low detail mode, some grass will not hide you in high detail mode. When you are in the grass, the monkeys can't see you and hence not attack you. Now find Karam. He is just barely north of the crafting shop. You can see the crafting shop if you look east of the jail on your minimap. He is running around in the grass and camouflaged in the same color so it can be hard to spot him at first, but you'll find him (hovering your mouse around the area can help). After talking to him head to the temple and go southeast to a small building, the King's Throne Room. To get there go in between this building and the temple as shown on the map, not the other way! Otherwise you will be knocked unconscious by ninja monkeys and you'll find yourself back in jail. Always move around the village and never through it! When you get there talk to Garkor, the squad leader, who needs you to rescue his three men and to talk to Zooknock about a disguise. When you are inside search the Depot but don't go out the shaded area or you will get ko'ed by the ninja monkeys. Search the crate in the southeast corner to find a secret entrance, go down the entrance (Some damage will be dealt because of falling down) and then search the crate in the northwest corner for an M'Amulet Mould. Go back upstairs to the Depot and walk over to the east side. Search the stack of two crates that is just inside the lightly shaded area of the floor, but be careful to search the crates from the darker part of the floor or you will be knocked unconscious by Ninja Monkeys and find yourself back in prison. After you correctly search the crates you should find some Magical Monkey Dentures. Now teleport out of Ape Atoll and refill your supplies. If you can't teleport, you can climb out of the cave and you'll find yourself in house close to the gates. Get out of the house and RUN back towards the sergeant, then RUN past the graveyard, climb up the ladder and then jump off the ledge to find Lumdo. 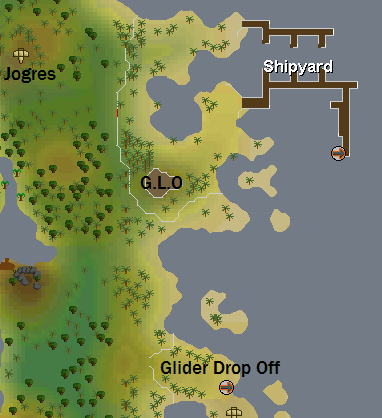 However, it's STRONGLY advised to teleport to Al Kharid and use the glider there to get back to the Grand Tree due to the chances of getting caught while leaving the Ape Atoll are extremely high. Getting to the mage is the most dangerous part of the quest and you'll have to do it at least two times. For this part it is strongly advised to wear the gear suggested above. You will also need to bring your gold bar, Monkey Dentures, and M'Amulet mould. When you have everything, head back to Ape Atoll and enter the dungeon in the south of the jungle. It's a very long cavern full of Zombie Monkeys and Skeleton Gorillas, traps and falling rocks. Hiding under the ledges when the screen shakes avoids the falling rocks but it is better to just take the damage and make a run for it. Have the Protect from Melee Prayer on all the time to protect you from the zombies and skeletons, this is a multi-combat zone so they will swarm you. The traps and falling rocks will still hit and poison you through your prayer but you'll be safe from the skeletons and zombies. The spike traps in the ground are marked with 5 black dots on the floor, when you walk over them you will get damaged and poisoned. Try to avoid them as much as possible. At the end, you'll meet up with Zooknock, the squadron mage. He needs a Gold Bar, the Magical Monkey Dentures and the M'Amulet Mould to make a monkey speak amulet. Give them to him and he will give you your M'Amulet Mould back and an Enchanted Gold Bar. You will need to bring these to the Temple on Ape Atoll later on to make the Amulet. Now it's the best to teleport back to Al Kharid and take the glider there back to the Grand Tree. If you can't do that use Home Teleport, and if that is impossible too you can go back through the Tunnel climb up and head back to Lumdo. Restock and recharge your prayer (if you use a Ring of Duelling you can restore fast in the Duel Arena), take the Ball of Wool, Enchanted Gold Bar and the M' Amulet Mould with you as well as the normal Monkey Madness Survival Gear. Head to the town the usual way by getting captured and then head to the temple. Inside the temple use your Protect from Melee Prayer, the guards can easily hit 150+ and it's a multi-combat zone. You can also restore your prayer here at the big gorilla (Marimba) statues. Don't let the gorillas trap you here as they will swarm you and you can't walk through them! The only spot where they can successfully trap you is at the stairs and the trapdoor. If this happens go down or up and wait a while until the guards have resumed their normal pattern. Go through the trap door downstairs and use the Gold Bar on the Fire Walls near the entrance to make an M'Speak Amulet, use a Ball of Wool on it and wear it. Watch out for the zombie monkeys below. 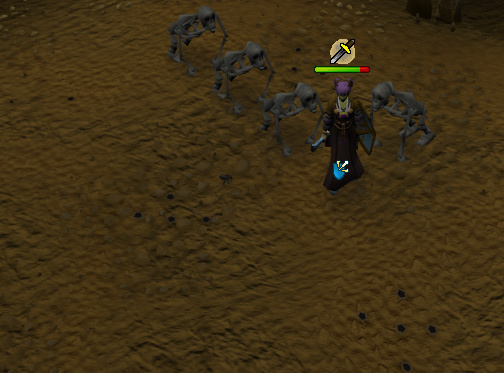 As six or seven of these undead monkeys can attack one player at a time, they can drastically lower your life points even with prayer. It is suggested you have a substantial amount of life points before entering the trapdoor. Now head to the Monkey Child in a Banana grove in the northwest of the city. Don't forget to go around the village and not through it. To get to him go counterclockwise around the city, then go into the building that's just east of where the Child is. Don't try to run all the way to the western side of the house as you have a good chance of the Aunt seeing you and calling in the Ninja Monkeys. Speak to the Child when his aunt has walked just south out of the grove and is standing by the fence. So pick 10 Bananas for him (just tell him those are 20, he can't count) at the banana tree patch near the gate of the town and give them to him. Wait a few seconds or talk to him a few times to learn his Aunt has given him the toy. You will then ask for and receive his new toy. He'll give you a Monkey Talisman. 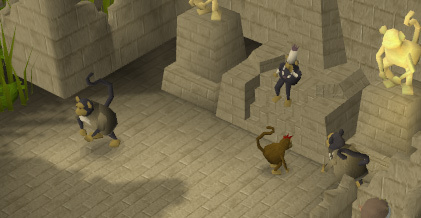 Obtain a Monkey Corpse or Bones (both will work) from a Karamja Monkey on Karamja by killing it by either ranging, meleeing or maging it, and bring both the Corpse or Bones and Talisman to the Mage the same way as before. You are also able to buy the bones. After doing so, you'll now be able to transform into a monkey. 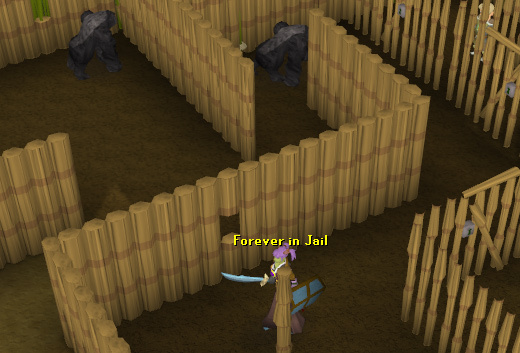 You can use the big gate without being target practice and ending in jail. Note: Always have one spot free in your inventory when wielding a monkey greegree. 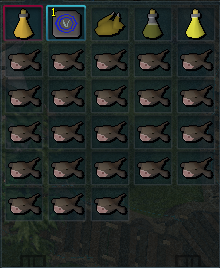 If you leave Ape Atoll and have no free spaces in your inventory, you will drop the greegree. Also it is best to use a teleport device now, since you can't cast spells in monkey form. From now on, always stay in Monkey form on Ape Atoll. Go back to the Sergeant Garkor. 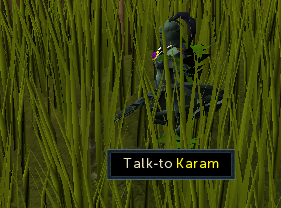 He wants you to make an alliance between the Karamja Monkeys and Marim Monkeys. Talk to the Elder Guard and he says that you need Kruk's permission to enter. Speak with Kruk, the monkey who shouts to open the gates when you enter in monkey form. He can be found near the gates up the second hill. To get to him, go just west of the bamboo gate after you have gone through and then follow the path up to a ladder, go up the ladder and across the bridge, then go down the next ladder. Once there you will find Kruk. 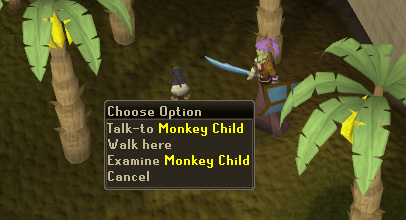 Kruk will take you to the Monkey King, Awowogei , and he wants you to bring back a monkey from the Ardougne Zoo. 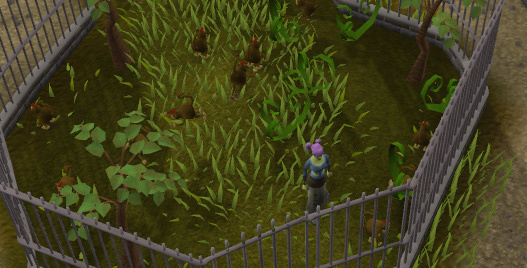 Go to the Ardougne Zoo with your Greegree and M'Speak Amulet, transform into a monkey and talk to the monkey minders outside... you'll be put in a cage! Talk to a monkey and promise to free it, it will then climb into your backpack. To get out again just revert to normal form and talk to the monkey minders. After a lame excuse about how you got in they will let you out with the monkey in your backpack. Now WALK (Warning: do not teleport OR log out! If you do that you will no longer have the monkey in your inventory!) to the Grand Tree and get back to Awowogei. He will think about the alliance. Go back to the Sergeant and he will give you the 10th Squad Sigil. Don't wear this until you're ready to defeat the Jungle Demon! When you lose this sigil you can get a new one from Waymottin who is one of the gnomes standing next to Zooknock the mage, so you will have to go through the whole tunnel again if you happen to loose the sigil. Don't forget you can do this in monkey form and thus avoid all combat, but not the traps and falling rocks. 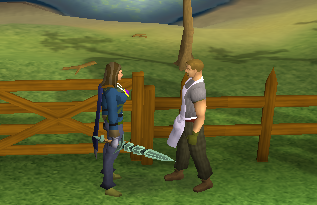 Tip: When you receive the sigil from Waymottin, drop the sigil and talk to him again. He will give you another sigil. Pick the sigil you dropped up, and you will have two of them in your inventory. In case you die fighting the monster at the end of the quest, you will have an extra sigil, and you won't need to traverse the long cave to obtain another. Although this level 100 Demon has been feared for year when you follow the tactics in this guide and have at least 37 Prayer for the much needed Protect from Magic Prayer you will be fine and the Demon will be dead in no time. For this you should bring food that heals you maximum lifepoints (similar to on the Atoll) and your best gear you have in your bank. Bringing stat boosting potions will be essential to lower levelled players and if you plan on praying bring one prayer potion. A ring of life is also recommended as it will get you out of dire situations. For the cannon method, expect to use at least 100 cannonballs. 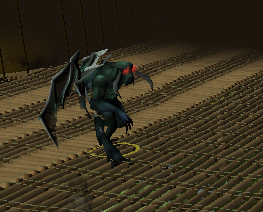 It is possible to do this without the recommended level 37 prayer, however players under level 90 will have trouble with this demon if no prayer is used. As soon as you wear the sigil, switch to run. When the screen shakes, which should be a short while after you wear the sigil (this is to save that extra prayer point) turn on Protect from Magic. Note: In the current combat system this method takes quite some time (the Demon has 15,000 life points) and is not suggested. As soon as Garkor is done talking, make a run for the nearest bridge. Cross it, and run over to the corner nearest to the members of the 10th squad. Be careful of spike traps along the way! Once at the corner, the Demon will be unable to mage you, so it's safe to turn off your protection prayer. From this viewpoint you should also be able to see the Demon's hp. Now is the slightly tougher part. Wait for the gnomes to weaken the Demon until its hp bar is nearly completely red. If you miss the timing, the demon will regenerate and you'll have to do this again. As soon as you see the hp bar turn red. run back out (don't forget your protect from magic) and try to K.O. the Demon with some quick hits. The best place to do this is on the bridge that you ran out from earlier. The demon will be unable to melee you and your Protect from Magic will take care of the rest. Note: You are unable to range or mage from the ledges, but you can do that on the bridges to the same effect. Let the gnomes do all the hard work for you, don't risk your life weakening it in the beginning! Make sure your Protect from Magic Prayer is on then start auto casting or ranging. Sip from your Prayer Potion when needed and above all keep distance! Don't let him hit you with melee. 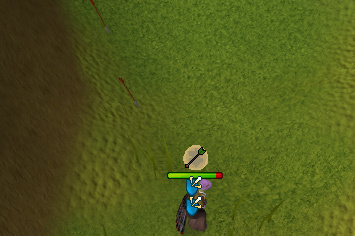 As a ranger you could use poisoned arrows to hurt the demon even harder, with Ava's Machine you can reclaim your arrows easily. If using Range or Magic isn't working out, you can always try melee. This is a bit harder considering you will not protected from one attack. You should pray against the magic attack (in melee armour you are weak to magic given the combat triangle) and grind it out. If you are still having trouble, try the below option. Make sure your Protect From Magic Prayer is turned on and take distance from the Demon to make sure it doesn't hit you with melee. Set up your cannon, load and fire it. Now you can wait and in the meantime range or mage it or you could hide behind the statue where the demon can't mage you. When needed go reload your cannon, don't forget to turn your prayer back on and be sure to stay clear of its melee attacks! This is by far the easiest way but also the most expensive. 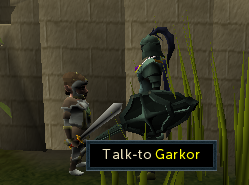 Once the Jungle Demon is dead, speak to Garkor, and then Zooknock. He will teleport you to the west coast of Ape Atoll, just north of the gates. 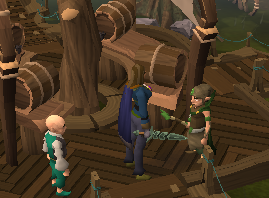 Head back to the Tree Gnome Stronghold where you can talk to the king and receive your reward. 3 Cut Diamonds 10,000gp Ability to transform into different monkeys - kill the Monkeys you want and bring their remains and a Talisman (1,000gp from the Magic Shop) to the Gnome Mage. Ability to use Marim shops and steal from Ape Atoll Stalls. Ability to speak to monkeys. 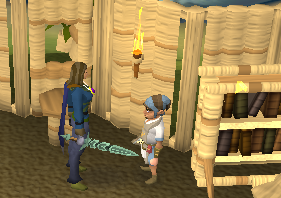 Ability to buy and wield a Dragon Scimitar - 100,000gp in the Scimitar Shop. Access to the Ape Atoll Agility course. Speak with Daero to get 35,000 experience in Strength and Constitution or Attack and Defence. You will also receive 20,000 experience in the 2 skills you didn't choose.